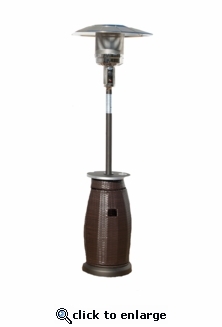 Entertain your guests outdoors year-round with our patio space heaters. Using a 20 lb. Propane tank (not included), these heaters produce plenty of heat to keep your guests comfortable during the chilliest weather. Styles include either a woven resin body or a quartz glass column pyramid with a rich Bronze finish and feature wheels to easily move them around. Aluminum frame. Assembly may be required.